The Belridge Solar Project is scheduled to break ground near Bakersfield California in 2019. When complete, it would produce 850 megawatts of energy annually, with GlassPoint Solar leading the project. Some of that energy would generate power for daily operations, but the most would be used in place of natural gas in a thermal (steam) enhanced oil recovery process. GlassPoint's solar steam generator enclosed trough technology houses thin curved mirrors inside a greenhouse. According to their website, "The mirrors track the sun throughout the day, focusing heat on pipes containing oilfield water. The concentrated sunlight boils the water to generate steam, which is then injected into the oil reservoir just like steam produced by burning fuel." It is with great excitement and pleasure that we announce our 3rd Annual Steam Meet & International Technical Conference March 7 and 8, 2014 in Los Angeles, California. please visit our Conference Information page. SACA and IAASP are pleased to co-host the second ever event to bring together on the west coast modern Steam Power Pioneers from the United States and around the world to participate with steam automobile owners and developers, modern steam locomotive experts, and small steam power plant developers and manufacturers, together with other steam power pioneers, engineers, and enthusiasts. For the Steam Meet and Technical Conference details and registration, please visit our Conference Information page. SACA and IAASP are pleased to co-host the first ever event to bring together on the west coast modern Steam Power Pioneers from the United States and around the world to participate with steam automobile owners and developers, modern steam locomotive experts, and small steam power plant developers and manufacturers, together with other steam power pioneers, engineers, and enthusiasts. On display at the event (and available for a close look by conference attendees) will be the U.S. Land Steam Record (USLSR) Team streamliner. Driver and car designer, Chuk Williams, has teamed up with engine developer Cyclone Power Technologies to build this modern steam-powered streamliner. This car will seek to become the fastest steam-powered vehicle on earth at the famous Bonneville Salt Flats in 2012. Mr. Tom Kimmell, Steam Automobile Club of America (SACA) President, has become the fourth steam power pioneer to support the IAASP Board with his exceptional practical steam power experience. The other Steering Committee members are: Peter Platell, PhD, Steering Committee Chair (Sweden); Shaun McMahan (Argentina); and Robert Ellsworth (Tennessee). In August 2009, the British Steam Car Challenge set the new world land speed record for a steam powered car. From the outset of the project, one of the stated and demonstrated goals of the British Steam Car team was to inspire young people and students to consider alternative, environmentally friendly methods of propulsion and to 'think outside the box'. To be sure, the team has done this. In September 2010, after its extensive tour was completed the British Steam Car took "pride of position" at The National Motor Museum Beaulieu as part of their land speed collection. The U.S. Land Steam Record (USLSR) Team will seek to surpass the British Steam Car Challenge team's record to become the fastest steam-powered vehicle on earth. This could happen this year at the famous Bonneville Salt Flats (as early as August 2011). The team includes Cyclone Power Technologies and their earth-friendly Cyclone Engine. The 5AT is a totally new steam locomotive design, incorporating the latest proven steam locomotive technology, for hauling main line steam charter and railcruise trains. With a 70% increase in thermal efficiency over "classic" steam, and almost 3500 horsepower available at the cylinders (more than a "Deltic"), its perfomance is expected to amply demonstrate what could have been achieved had steam locomotive development been fully exploited in the 20th Century. Pritchard Power Systems, is now Uniflow Power with new financial support behind their small steam engine fuelled with renewable fuels, the S5000, designed to produce around 5kWp of electricity. Designed by Ted Pritchard, the S5000 was intended by Ted to be a small scale, multi-utility, enterprise energy system, capable of delivering mechanical power and electricity, hot water, space heating and if required, steam, all from the lowest grade fuels. Cyclone Power Technologies has completed the installation and successfully powered-up its initial waste heat power generator. A powerful team is now in place and on board to steer IAASP during 2009. The three steam power pioneers who have volunteered to support the IAASP Board with their exceptional engineering and practical steam power experience are: Peter Platell, PhD, Steering Committee Chair (Sweden); Shaun McMahan (Argentina); and Robert Ellsworth (Tennessee). The 2009 quarterly IAASP International Steam Power Pioneers' conference calls are set to continue to expand on the latest developments in steam power. Already planned are calls covering high-speed steam powered automobiles, modern efficient steam powered locomotives, the latest steam electric generators for home and village, steam power and the zero-energy house, and more. If you are a steam power pioneer, please contact Dennis Dudzik, P.E. () to be added to the call list. "The car has now completed 6 dynamic runs... We have had a preliminary meeting with Edwards Air Force Base, in California, about the possibility of running the car on the dry lakebed, once it has dried out following winter rains. During the trip to Los Angeles we were able to visit a number of potential suppliers. These included locating a source of demineralised water, liquid propane, communications, rental equipment and accommodation for the team." In September 2008 Pritchard Power Systems, with assistance from the Federal [Australia] Government's COMET program, completed and demonstrated a small steam engine fuelled with wood pellets, the S5000, designed to produce around 5kWp of electricity. Designed by Ted Pritchard, the S5000 was intended by Ted to be a small scale, multi-utility, enterprise energy system, capable of delivering mechanical power and electricity, hot water, space heating and if required, steam, all from the lowest grade fuels. Now selling small steam power plants! This is another "must see" site. "There is a silent revolution throughout the world in energy sector. There is a trend towards decentralized and distributed generation of renewable energy. Centralized giant thermal power plants are highly capital intensive and not suitable for homogenous rural development." Here is what the British Steam Car Challenge site has to say about their exciting project. "Automotive racing has always pushed the envelope of technology and led the forefront of automotive change. Man's desire to go faster has led to advances in existing capabilities. In this arena, the trend continues. In the past year, more than 10,000 visitors per month have visited our SteamPower.com website. And, the numbers continue to increase, as the word continues to spread, that "Green" energy sources are often best utilized in modern steam power systems. You can now see the latest news, publications, and modern steam power related websites available anywhere on the Internet at www.SteamPower.com. And, while you're there, check out the selection of educational and entertaining steam powered toy websites featured on our NEW "Steam Toys" page. We are excited to announce that the interest in steam power and IAASP's website continue to spread to many international locations. In just the past month, our website has served visitors from the US, Sweden, Germany, Canada, Norway, Denmark, the United Kingdom, Australia, the Netherlands, Singapore, Romania, among others. We are so grateful for the opportunity to share Steam Power related news and information with so many of our international friends. To better serve and inform our international visitors, we have added an automatic translation feature to the IAASP website. With one click you can now translate our website into French, Spanish, or German. To access this feature, click on one of the flags at the top of any page. We plan to add more languages as the technology develops. Now anyone wanting to donate to IAASP can use their credit card or PayPal account to help support our efforts directly from our site! It is secure, safe, and simple. Our hope is that the thousands of people who come to our site every month from around the world who may not wish to become "Participating Members" can still contribute and support Steam Power for as little or as much as they want without any further obligations. You can make a donation simply by clicking one of the "Make a Donation" buttons on the left of any page. Thank you for your interest in the future of innovative, modern, distributed, renewable, and sustainable steam power. IAASP is pleased to add the Steam Automobile Club of America (SACA - at http://www.steamautomobile.com/) to our family of members, and we are pleased to be new members of SACA. We specifically want to invite the SACA steam power pioneers to drop us a note and let us know what you are up to. IAASP is happy to post your articles or links to get the word out on modern steam power in America. Please let us know how we might be of service. Production ICE/Steam Hybrid automobiles may be only 10 years away. The hybridization of the automobile engine continues. According to BMW, modern integrated automotive steam power is under development and moving forward on a fast track. Here are this month’s three steam power (and related) headlines. Two circuits power the steam engine expander. The high-temperature circuit uses heat exchangers to extract exhaust heat from the internal combustion engine (ICE). Steam is then conducted directly into an expander linked to the crankshaft of the internal combustion engine. Most of the remaining residual heat is absorbed by the cooling circuit of the ICE (using ethanol as the working fluid), which acts as the second energy supply for the Turbosteamer. The Siemens Power Generation Group (PG) is acquiring 100 percent of shares in the joint stock company AG Kühnle, Kopp & Kausch. Headquartered in Frankenthal, Germany, this company develops, manufactures and markets steam turbines with a rating of up to 5 MW, as well as turbocompressors and fans for industrial applications. The company has locations in Frankenthal, Bad Hersfeld, Zweibrücken and Leipzig (Germany) and in Helsingor (Denmark) and recorded sales of around EUR270 million in 2005 with a workforce of approximately 1,400. The take-over is subject to the approval of the anti-trust authorities. Here is a technology that may have potential technology transfer applications to steam power in mobile and stationary applications. As reported in the sources below, the Scuderi Group has secured patent protection for its Split-Cycle Engine in key global markets including China, Japan, Taiwan, and Russia. The patents are a major step toward complete worldwide protection of the Scuderi air-hybrid engine design. The development of modern small steam power remains the responsibility of a relatively small, but growing number of dedicated pioneers. Also growing in numbers are the modern steam power visionaries, enthusiasts, scientists, and engineers supporting the rebirth of the industry. Throughout the first three quarters of 2005, a few steam power pioneers expanded the available information about the latest developments via their websites or communicated in scientific papers. IAASP continues to recognize the efforts of the international community of Steam Power Pioneers. We create opportunities for individuals, small, and emerging companies to become better known by the general public and collaborate with their counterparts in the steam power industry. Based on the results of our networking in 2005, here are the top Steam Power Pioneers on the Internet today, and the web addresses that tell their steam power stories. After you visit them, let us know. And, we are always looking for the steam power pioneers we have yet to meet. T. W. BLASINGAME COMPANY, INC. The past 12 months have been an opportunity for all of us at IAASP to expand our relationships with steam power pioneers, and develop a better understanding of how IAASP can best serve to advance the state of the science of modern steam power. Here are some of the lessons we have learned (and re-learned) this year. Unlike more mature alternative power technologies (such as wind), and unlike the fuel cell industry (with the continued promise of high cost, high tech, high efficiency, and high visibility) the development of modern small steam power remains the responsibility of a relatively few dedicated pioneers. These steam power pioneers, as a group, are being careful to limit their communications to what they choose to post on their websites or communicate in limited email replies. Large public gatherings (such as conferences and symposia), along with the associated uncontrolled exposure to external inquiries, are not yet of value to most of the modern small steam power industry. The IAASP 2004 International Steam Power Conference on Small Steam Electric Generation, planned for this past November, was postponed in favor of continued individual contacts and small conference calls among like-minded steam power pioneers. It is clear that the industry can benefit most from education of the general public, as well as mutually beneficial information exchanges, and international relationship building among members of the modern steam power industry. 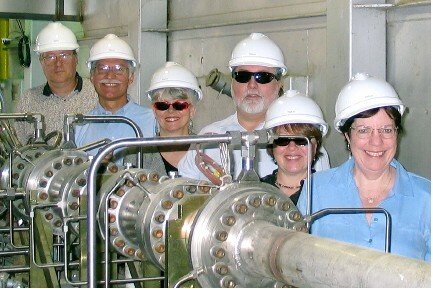 On October 14, 2004, the IAASP president and founder (Dennis Dudzik), along with some of the IAASP Board of Directors and staff toured the Clean Energy Systems Inc. (CES) Kimberlina Power Plant, near Bakersfield, California. CES has developed zero-emission fossil-fueled power generation technology, integrating proven aerospace technology into conventional power systems. The core of CES’ process involves replacing steam boilers and flue gas cleaning systems with “gas generator” technology adapted from rocket engines. The gas generator burns a combination of oxygen and a gaseous hydrocarbon fuel to produce a mixed gas of steam and carbon dioxide at high temperature and pressure, which powers conventional or advanced steam turbines. High efficiencies are obtained for utility-sized power plants, but without any atmospheric emissions. Possible fuel sources include renewable biomass, natural gas, or coal syngas, and the cycle is a net producer of water when air cooled condensers are used. For more on the revolutionary CES steam power technology, visit their site at: http://cleanenergysystems.com. Special thanks to Dr. Stephen E. Doyle (CES Executive Vice President) and the CES site staff for their terrific hospitality and permission to use the photo below! Shown standing behind the gas generator, from right (front) to left (back) are: Pamela Dudzik, Kathleen Shea, James Shea, Kathy Stora, Dennis Dudzik, and Rick Stora. Yes, http://cleanenergysystems.com is the IAASP site of the month for December 2004. We are convinced that this is a revolutionary steam power concept that could also find pivotal applications in the small steam electric generation and steam powered transportation markets. The site takes you through the details of this pioneering technology in a way that is easy to understand. IAASP is now accepting contributions to enable us to expand our educational and relationship building activities. Our new website at www.steampower.com is already under construction. Your participation will support IAASP build the programs and outreach that we believe will be most effective in advancing the state of the science of modern steam power. Interested in joining us? See our participant application and benefits at our new Join Us page.